The Pro-Tec™ IV 5 cc Syringe Shield is an ideal shield for the administration of Quadramet®. It reduces hand exposure, maximizes the viewing area and is convenient to use. The barrel of the shield is constructed of optically clear high-density (5.6) lead glass. The end of the lead glass barrel is tapered so that the contents of the syringe can be viewed. The 360° view and taper make venipuncture faster and easier. The high-density lead glass significantly reduces radiation exposure from Sm-153 by greater than 99%. The Safe-T-Lock design provides increased protection by allowing minimal handling. It grips and secures the syringe upon insertion and releases the syringe at the press of a button. 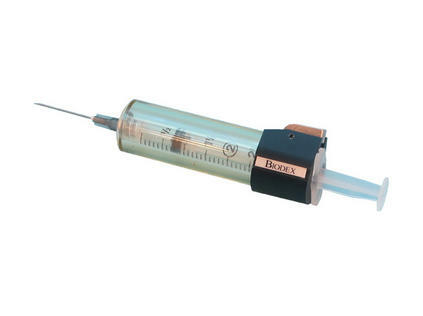 Disposing used syringes is easy; invert the syringe shield over a sharps container, press the release button and the syringe freely disengages.